Contest starts May 1st, 2015 - May 31, 2016. 1) Make hard bait purchase, for every bait purchased, that is how many chances you'll be entered. E g., Buy 5 baits, get your name entered 5 times, buy 7, get your name entered 7 times, etc. The more you purchase, the better chance you'll win! 3) Winners will be notified by email & called & will be posted on this site. 4) Winners will have prize package mailed to them shipped Priority mail. 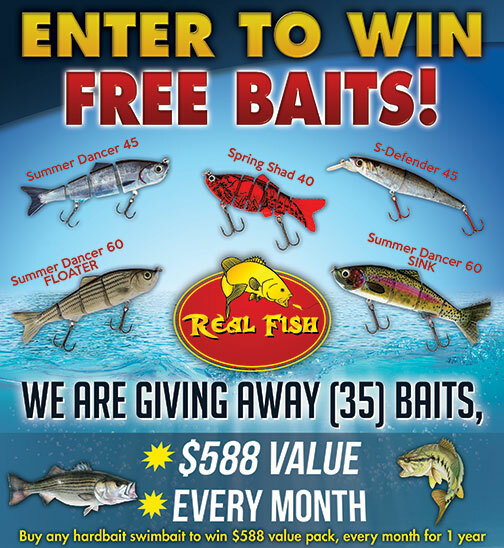 5) 5 winners will be drawn each month to win 1 of 5 bait bundle prize, total value $588. Each bundle prize consists of 7 baits, 35 baits in all. (Package 1) - 4" Spring shad all 7 color $98 Value! (Package 2) - 4.5" Summer Shad all 7 color $112 Value! (Package 3) - 4.5" S-Defender all 7 color $112 Value! (Package 4) - 6" Summer Dancer - Sinking all 7 color $133 Value! (Package 5) - 6" Summer Dancer - Floater all 7 color $133 Value!